North Cheyenne Cañon Park is located on the southwest side of Colorado Springs. North Cheyenne Cañon Park is cut 1,000-feet deep into the 1.5 billion-year-old granite rock. This 1,600-acre park provides good habitat for large animals such as the Black Bear, Mountain Lion and Mule Deer, and little birds that love water, like the Kingfisher, American Dipper and Broad-tailed Hummingbird. North Cheyenne Creek runs along the bottom of the canyon. 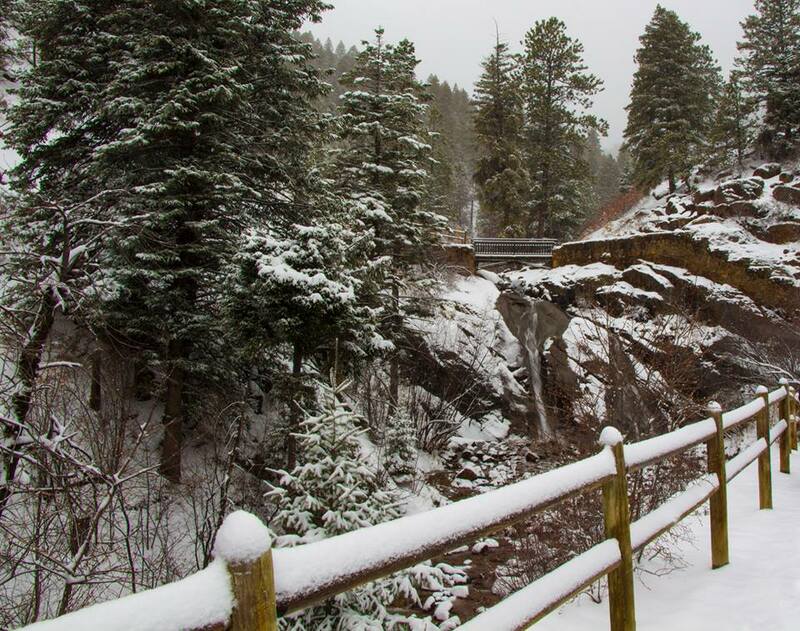 Visitors can drive, hike and bike from the entrance of the canyon up to Helen Hunt Falls. Beyond Helen Hunt Falls, North Cheyenne Canyon Road continues until it reaches Gold Camp Road. There is a large parking area where bikers, hikers and runners can access additional trails. An extensive trail system open to hikers, bikers and runners. Dogs are allowed and must be leashed. Two visitor centers. Starsmore Visitor and Nature Center is located at the entrance to the park. 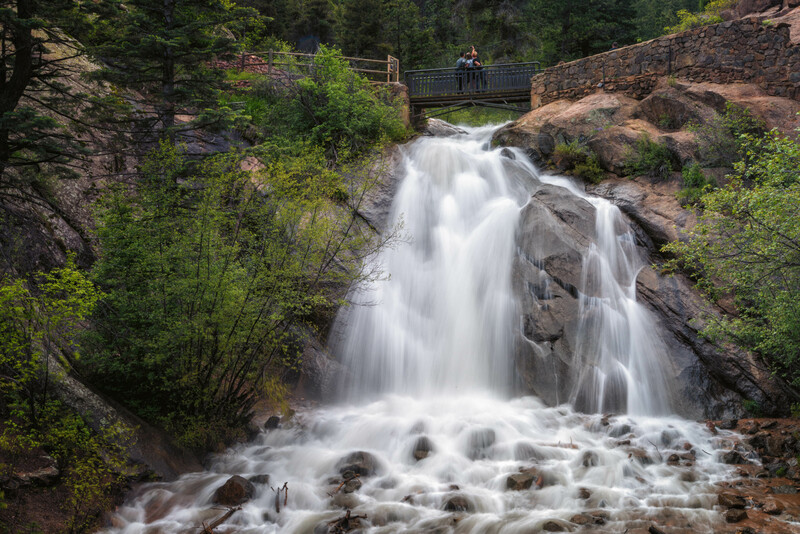 The Helen Hunt Falls visitor center is located near the base of the falls. Portable toilets are located at Helen Hunt Falls. Each year, more than 450,000 people visit this unique City of Colorado Springs park property. Access to this park is a gift to all of our citizens and visitors. General Description: This trail makes its way up the Canon from behind the Starsmore Discovery Center to the Upper Columbine trailhead near Helen Hunt Falls. The Mid Columbine trailhead is about 1 mile up the road from the main park gate by the Starsmore Discovery Center. The Upper Columbine trailhead is about 350' east of Helen Hunt Falls. Hikers, cyclists and equestrians can use this trail. General Description: The trailhead is on the south side of the road, about 1.5 miles up the road from the main park gate by the Starsmore Discovery Center. Hikers only. General Description: Park in front of the Helen Hunt Falls Visitor Center, hike over Helen Hunt Falls and continue along the trail. For your safety, please DO NOT hike beyond the plaza area to the closed-off portion of Gold Camp Rd. This is a connecting trail. Length: Trail itself, approximately .72 miles each way between Mid Columbine and Lower Gold Camp Road. The trailhead on Mid Columbine Trail is 1.68 miles from Starsmore Discovery Center, .68 miles from Mid Columbine trailhead, and 2.31 miles from Upper Columbine trailhead. The Lower Gold Camp Road trailhead is across from Captain Jack's Trail parking lot at the east end of Tunnel #1. General Description: This trail serves as a connecting trail between Gold Camp Road/Captain Jack's Trail and the Columbine Trail. It is open to hikers and cyclists only. General Description: Drive about 3.2 miles from the Starsmore Discovery Center to the parking area where North Cheyenne Canon Rd, High Dr. and Gold Camp Rd. intersect. Park here. Hike along the closed portion of Gold Camp Rd. to Tunnel #3. Follow the trail up and over the tunnel to St. Mary's Falls. General Description: The trailhead is directly east of Tunnel #1 at the multi-use trail sign. The Captain Jacks Trail system is a multi-use system that allows hikers, bicyclists, equestrians, and motorcycles. For those who are up for a real challenge, the Captain Jacks Trail joins with the Jones Park Trail at the saddle behind Mt. Buckhorn, and the trail continues for another 2.4 miles to Jones Park. General Description: The trailhead is directly off the closed portion of Gold Camp Rd. (on the west side). Park at the intersection of Gold Camp Rd, High Dr. and Cheyenne Cañon Rd. Hike past the gate, which is in the northwest corner of the parking area, and follow the closed portion of Gold Camp Rd .7 miles to the trailhead. The trail is unmarked, so you will need to watch for the creek that goes under the road, and the trailhead will be on your right. This is a moderate hike, which crisscrosses Cheyenne Creek over a series of seven bridges. Length: About 1.1 miles from the top of Gold Camp Rd. to the Chamberlain Ridgeway Spur between the reservoirs. General Description: This trail can be accessed from Stratton Open Space at the Ridgeway trailhead or at the La Veta trailhead. You can also reach the Chutes trail off of Gold Camp Road. Go past the Section 16 trailhead parking area and most of the houses. Look for the large rock with the pine tree growing out of it on the left. Beginning at the parking area on Gold Camp Rd., the Chutes is a popular trail for cyclists because of it’s winding curves and fairly fast descent. Once at the reservoirs, there are several developed trails through the Stratton Open Space that can be accessed easily. Suggested bicycle use only; hikers refer to Gold Camp Path (Stratton Open Space Trails). Current Trail Lengths: Chamberlain-Ridgeway Spur: 1.1 miles; Gold Camp Path: .8 miles; Ponderosa: .4 miles; South Suburban Lower Loop: .4 miles; South Suburban Upper Loop: .6 miles; Stratton Springs Path: .5 mile; Upper Meadows Loop: .7 miles; Wildflower Path: .7 miles. General Description: There are three trailheads that service the Stratton Open Space: 1) La Veta Way off Cresta Rd; 2) Ridgeway off W. Cheyenne Blvd. and 3) trailhead on the north side of the road about .3 miles up the road from the main park gate by the Starsmore Discovery Center. Most of the trails within the Stratton Open Space are easy to moderate in difficulty and offer "loops" that allow users to enjoy the Open Space. Keep in mind that all trails designated as "paths" are for hiking only; equestrians and cyclists may use all of the other loops. Black bear and mountain lions are more active at dawn and dusk. Also, black bear can be active at all times of the day/night, searching for food prior to hibernation. A mountain lion's predatory instinct can be activated by things that are going fast or are small and making high-pitched sounds (esp. during the times they're most active). Keep small children close to you and don't let them run ahead or lag behind on the trail. Use extra caution where hearing or visibility is limited: in brushy areas, near streams, where trails curve around a bend or on windy days. Reduce your chances of surprising a bear or mountain lion by talking, singing or wearing bells during the times they're more active. Unless there's a bear-proof trash can around, take any garbage with you. Avoid berry patches in the fall. Volunteer time commitment is FLEXIBLE. School-age: "Nature Detectives", "Animal Habitats", "Insects Everywhere", "Junior Ranger"
School age to Adult: "Tipi Building and Ute Heritage Workshop"
Volunteer Training Workshops are scheduled throughout the year. Plus a wide variety of Enrichment Events are scheduled. Enrichment Events are open to volunteers and members of Friends of Cheyenne Cañon. Others may attend Enrichment Events by joining Friends of Cheyenne Cañon. Change in the forest is constant and may be extreme with freezing temperatures and winter snow, to monsoon rain and flash flooding, or to sun-baked droughts and fires. There are no clear-cut lines of where trees grow. In moist pockets, White Fir, Ponderosa, Douglas Fir and Aspen trees grow side-by-side. Douglas Fir trees are the climax species that will grow to dominate the forest if there are no disturbances, even on the south-facing slopes, where Ponderosa Pine thrives. If a Ponderosa Forest becomes too thick and shady, the Ponderosa seedlings will not grow healthy. The Douglas Fir seedlings will grow strong in the shady, overgrown conditions and will eventually crowd out the Ponderosa. Aspen trees are a pioneer species that are quick to grow after a disturbance such as an avalanche or fire. Aspens have suckering root systems that can grow or die back according to sunlight or competition from shade-loving plants. After a forest fire creates a clearing in the forest, Aspens begin to sprout from the root system that remains alive undergrown, waiting for a sunny opportunity to grow. The Great Plains that stretch to the eastern horizon are inhospitable to trees. The sandy and clay soils do not hold enough water to support large plants such as trees. Plains Cottonwood trees mark the presence of water on the harsh, dry grasslands. Trees naturally grow along creeks and rivers like a green ribbon across the prairies. Today, the native trees are hard to find in the urban forest that has grown up with our city at the foot of Pikes Peak. Since 1972, city foresters and citizens have been planting trees, and with the help of irrigation water, our hot, dry grasslands have shade. Water seeps into the fractures and spaces among rocks. Trees naturally cover the bluffs, foothills and mountains that mark where Colorado Springs lies at the edge of the high plains. The mountain cañons were once among the few green and shady places to be found near our city. Growth patterns that change with elevation and water supply are easily seen here. Visitors may notice how the cool north-facing and the hot south-facing slopes of the mountains support different variations of trees, shrubs and ground cover. Plant and animal diversity is abundant in this mountain park where 3 different life zones are intermixed in this area defined as an ecotone. The creek supports a moist riparian life zone that flows from the high elevation mountain life zone down the steep Cañon to the lower elevations of the foothills life zone. There is more moisture on the north side of a mountain, because snowfall lasts longer in shade locations, slowly melting into the soil. The cool temperatures also reduce evaporation of rainwater. You can feel the shade created by the trees and listen to the chatter of the little Chickaree Squirrel or the beautiful blue-colored Stellers Jay. Douglas Fir and White Fir trees tend to grow closer together and the crowns of their treetops grow into a closed canopy forest with patchy sunlight reaching the ground. The triangular shape of a Fir's branching pattern makes it very efficient at collecting sunlight while growing close to other trees. Mosses, mushrooms and moisture-loving flowers are found in these cool, shady places. Each tree must compete for sunlight. Young Fir trees are able to grow under the shade of their parents for a few years. Many seedlings and saplings can be seen growing within inches of each other. Eventually, dominant trees will live and weaker trees will die out because they can not compete for water and sunlight. You can notice that big trees are spaced further apart than the little trees. Seedlings--are up to 3-feet tall. Saplings--are between 3- and 10-feet tall. Pole Size--trees have a diameter between 6 and 10 inches wide. Standard Size--trees have a diameter between 10 inches and 2-feet wide. Veterans--have a trunk that is over 2-feet wide. Think about tree years compared to human years. You can roughly estimate the age of seedling and sapling trees by counting the spaces in-between whorls of branches they produce each summer. The sunny southern slope of a mountain is hot and dry. Water is scarce because of intense sun and rapid evaporation. On Cheyenne Cañon's south-facing slopes you can feel the heat of the sun and smell the sweet red bark of a Ponderosa. You can look for a black or gray Alberts Squirrel with long tufted ears. The long-tailed black and white Magpie has blue-green colored feathers if the light is right. Ponderosa Pines thrive on southern slopes. Ponderosa have a deep, moisture-seeking taproot, and a broad, rounded, branching pattern for the crown. A healthy Ponderosa forest is open and sunny because trees space themselves far apart to avoid competition for precious water. Other common plants found in this sunny forest are Scrub Oak, Yucca and Kinnikinik. The Ponderosa has thick, insulating bark that protects it from small fires. The low branches of trees eventually die and fall off because they do not collect much sunlight. This self-pruning of an old branch also helps trees survive small grass fires that do not reach high branches of the crown. 1840s--A trapper named George Ruxton documented a terrible fire in his journal. He described Cheyenne Mountain as being "invaded by the devouring element," of flames one night, and the skies glowed for 14 nights longer as the mountains 40 miles further west, (to Wilkerson Pass) burned. 1890--The Colorado Springs Gazette reported on Sunday, January 26, of a fire from the day before. "Old Cheyenne Mountain, standing out bold and alone from the range, was a seething mass of fire. It was grand, but pitiable to those who realized what such a fire means." 1950--The last major fire was also in January. On the 17th, the range from Cheyenne Mountain on toward the south was in flames. The US Army sent troops to fight the fire. Seven Camp Carson soldiers lost their lives working to bring the inferno under control. The upper layer includes the leaves and branches of tall trees such as Douglas Fir, White Fir, Ponderosa and Aspen. Underbrush: The middle layer includes shrubs like Boulder Rasberry, Rocky Mountain Maple and Chokecherry. Surface: The ground layer includes grass, Poison Ivy, and wildflowers, such as Shooting Star, Mariposa Lily and Columbine. Underground: The unseen world includes burrows, roots and wormholes where fungi and microorganisms help make soil rich by decomposing dead plants and animals. Buffalo Creek originates from natural runoff on Mount Rosa. It converges with North Cheyenne Creek below the Silver Cascade falls and beyond the ridge that separates it from North Cheyenne Creek. In Colorado's dry climate, water is our most precious resource. This wet ribbon of land is essential for all wild animals. In the Cañon, look for a natural spring flowing from the middle of the trail or seeping from the rocks. Notice the abundance of lush-green plant life, including Wild Roses and Aspen. Massive tree trunks mark the spot where you can enjoy the shade of giants. The veteran size of the fir trees in this moist pocket among boulders and waterfalls does not mean they are ancient in age. Trees can grow to be very large if they have plenty of water and sunlight. Photographs taken 100 years ago show sapling and pole-size trees at this site. Mountain building forces began pushing blocks of solid granite to high elevations 65 million years ago. 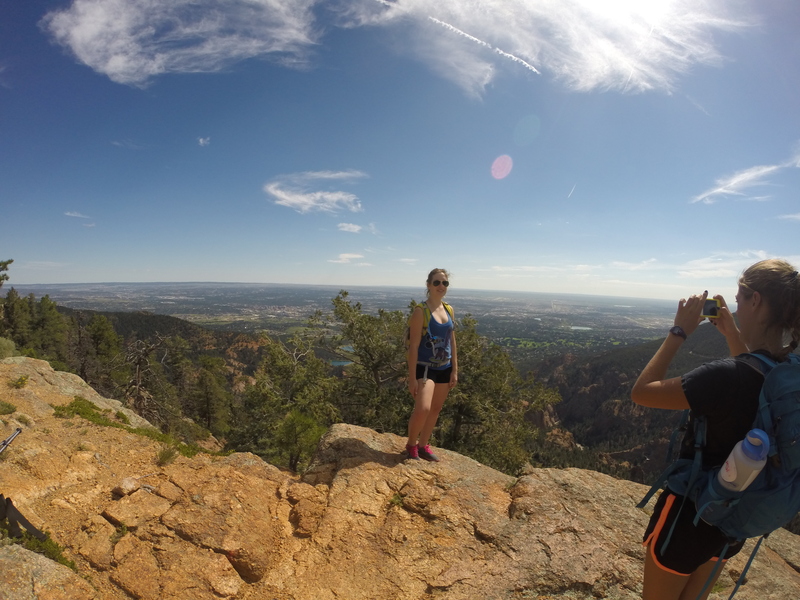 Cheyenne Mountain was shoved out and over rock formations that are younger than the granite. The upheaval and release of pressure on the granite caused it to expand and form many joints and fractures. Erosion followed mountain building and nearly leveled the mountains with the plains. Approximately 17 million years ago, earthquakes forced the mountains to rise again and the foothills were being scoured by intense erosion. At a much slower rate, this process continues today. The Ute Pass Fault line that separates these uplifted mountains from the foothills and plains can be noticed at the base of Cheyenne Cañon where the granite of Mount Cutler rises abruptly through the sedimentary sandstones and clay soils on the flat-topped mesa above the Starsmore Discovery Center. Thunderstorms cause tremendous downpours and flash floods. You can see the mountains dissolving into the muddy gravel during a severe storm. Within minutes, the creek becomes a torrent of red-earth colored water, and it does not clear until hours after the storm. The pink-colored Pikes Peak Granite makes up most of the rocky Cañon. It has many joints and fractures. Water gets into cracks in the rocks and it easily crumbles into gravel. When the water freezes, it expands and forces the cracks to open wider. For millions of years, this freezing and thawing of water have caused the Pikes Peak Granite to shatter in slow motion. Notice the gravel or "scree" slides on the mountains. The creek has no trouble cutting through and removing this loose rock material. The three most noticeable materials of the Pikes Peak Granite are the milky and smoke Quartz, the pink Feldspar and the silver or golden to black Micas. The Feldspar and Mica weathers easily. The creek has carved deep into the Pikes Peak Granite and has exposed large, rounded boulders of the gray-colored Quartz Monzonite, which is formed like a solid rock bubble within the more fractured and jointed Pikes Peak Granite. The Quartz Monzonite is more durable with less Mica and Feldspar and more Quartz. The water has smoothed and polished these boulder outcroppings into water slides with steep falls. Algae and loose gravel on the surface of wet rocks add danger and slippery conditions. Please do not risk your safety--stay on the trails behind barriers and out of the creek! Prehistoric people lived in Colorado at least 15,000 years ago. Palco hunters on the eastern plains are known to have killed mammoth elephants during the ice age. Garden of the Gods city park has artifacts that are 3,500 years old. Some ancient campsites have been found on high mountains above the tree line. Evidence only suggests where those people traveled to, and who their descendants are. The first historical records concerning Colorado were written by the Spanish explorers. The boundaries are not exact but many tribes were known to spend time in Colorado. The mountains were considered Ute territory. The Ute People have no migration story and they know that they have lived here forever. Many different people from the 1500s to the late 1800s occupied the eastern plains. Spanish records document that the Comanche, Apache and the Kiowa lived on the plains before the Cheyenne and Arapaho made it their home. 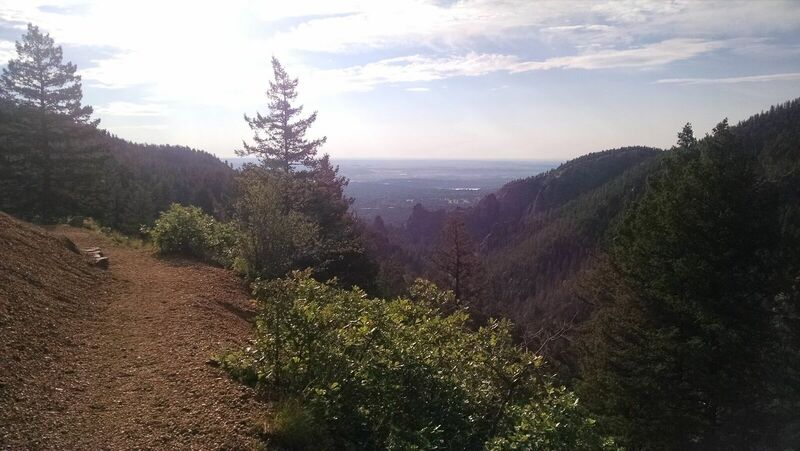 Cheyenne Mountain is named after the Cheyenne Indian People. Cheyenne Mountain was noted as a good place to gather teepee poles. Cheyenne and Arapaho people may have been attracted to the Cañons because waterfalls offer spiritual inspiration. Almagre is a Spanish Name. The name Almagre (AL-MA-GREY) pays tribute to the original Spanish name for Pikes Peak. In 1779, Governor Don Juan Bautista de Anza of New Mexico first mapped "La Sierra Del Almagre." Almagre means red earth and is descriptive of the pink-colored rocks of these mountains. Our spelling of the word Cañon with the ñ is also a tribute to our early Spanish heritage. Pikes Peak is named after Lieutenant Zebulon M. Pike. Pike was sent west by President Thomas Jefferson to explore the Louisiana Purchase. In November of 1806, he made an unsuccessful attempt to climb the mountain that now bears his name. Ute Indian People called Pikes Peak by the name Tavakiev (Sun Mountain). Sun Mountain was a very spiritual part of the Southern Ute territory. It was honored because it is the first of all of the high peaks of Colorado to greet the morning sun. In 1885, the citizens of Colorado Springs voted to purchase 640 acres in North Cheyenne Cañon from Colorado College to be used as a recreation area. In 1907, the city's founder, General William J. Palmer donated 480 acres in the upper Cañon, including Helen Hunt and Silver Cascade Falls, along with the "High Drive," that leads to Bear Creek Regional Park. Fred Chamberlain also donated land to the park. Known for its stunning rock formations, waterfalls, evergreens and wildflowers, hiking paths, picnic grounds and bubbling Cheyenne Creek, North Cheyenne Cañon Park was dubbed by the Park Commission in 1909 as "by far the grandest and most popular of all the beautiful cañons near the city." In 1992, the Starsmore Discovery Center opened its doors to the public. The 1918 stone house was moved to the mouth of North Cheyenne Cañon and its transition to a visitor center was made possible with assistance and donations from the Starsmore family and Friends of Cheyenne Cañon. The Center features nature exhibits, a climbing wall and educational programs. North Cheyenne Cañon Park today remains a popular destination for hikers, picnickers, rock climbers and those who enjoy the view of rugged granite walls, towering pines, rushing waterfalls and the always captivating Cheyenne Creek. Extensive rock walls and beautiful bridges may be seen throughout North Cheyenne Cañon. Some of the bridges date as early as 1914. The Starsmore Discovery Center at the base of the Cañon is an outstanding example of stone craftsmanship. The 1918 Starsmore Home is now a free Visitor Center for Cheyenne Cañon. Some of the stonework in Cheyenne Cañon is from the Civilian Conservation Corps Era of the 1930's and the 1940's. The C.C.C. was part of Franklin D. Roosevelt's "New Deal" to put people to work during The Great Depression. Their noble mission was to protect the nation's natural resources. The stone stairways and walls along this trail are of historic and artistic value. Walls and fences are designed to protect our natural resources. People cutting across trails and killing the ground cover plants that should hold the soil in place have increased extreme soil erosion. The walls in the Cañon are also to protect visitors from serious accidents. Please protect the park and yourself by staying on the designated trails while visiting Cheyenne Cañon Park.